I came across a blog post this morning entitled Does Science Produce Too Many PhDs? I think the answer is an obvious “yes” but I’ll use the question as an excuse to rehash an argument I have presented before, which is that most analyses of the problems facing yearly career researchers in science are looking at the issue from the wrong end. I think the crisis is essentially caused by the overproduction of PhDs in this field. To understand the magnitude of the problem, consider the following. Assume that the number of permanent academic positions in a given field (e.g. astronomy) remains constant over time. If that is the case, each retirement (or other form of departure) from a permanent position will be replaced by one, presumably junior, scientist. This means that over an academic career, on average, each academic will produce just one PhD who will get a permanent job in academia. This of course doesn’t count students coming in from abroad, or those getting faculty positions abroad, but in the case of the UK these are probably relatively small corrections. Under the present supply of PhD studentships an academic can expect to get a PhD student at least once every three years or so. At a minimum, therefore, over a 30 year career one can expect to have ten PhD students. A great many supervisors have more PhD students than this, but this just makes the odds worse. The expectation is that only one of these will get a permanent job in the UK. The others (nine out of ten, according to my conservative estimate) above must either leave the field or the country to find permanent employment. The arithmetic of this situation is a simple fact of life, but I’m not sure how many prospective PhD students are aware of it. There is still a reasonable chance of getting a first postdoctoral position, but thereafter the odds are stacked against them. The upshot of this is we have a field of understandably disgruntled young people with PhDs but no realistic prospect of ever earning a settled living working in the field they have prepared for. This problem has worsened considerably in recent years as the number of postdoctoral positions has almost halved since 2006. New PhDs have to battle it out with existing postdoctoral researchers for the meagre supply of suitable jobs. It’s a terrible situation. Now the powers that be – in this case the Science and Technology Facilities Council – have consistently argued that the excess PhDs go out into the wider world and contribute to the economy with the skills they have learned. That may be true in a few cases. However, my argument is that the PhD is not the right way to do this because it is ridiculously inefficient. What we should have is a system wherein we produce more and better trained Masters level students and fewer PhDs. This is the system that exists throughout most of Europe, in fact, and the UK is actually committed to adopt it through the Bologna process. Not that this commitment seems to mean anything, as precisely nothing has been done to harmonize UK higher education with the 3+2+3 Bachelors+Masters+Doctorate system Bologna advocates. The training provided in a proper two-year Masters programme will improve the skills pool for the world outside academia, and also better prepare the minority of students who go on to take a PhD. The quality of the PhD will also improve, as only the very best and most highly motivated researchers will take that path. This used to be what happened, of course, but I don’t think it is any longer the case. Although I’m in the middle of a very busy day (with no time for a lunch break) I thought I’d take a few minutes to advertise a very special one-off opportunity. As many of you will be aware, the Chancellor of the Exchequer announced in the Autumn Statement last year that loans of up to £10,000 would be made available to students on postgraduate (Masters) courses from 2016/17 onwards. Welcome though this scheme may be it does not apply to students wanting to start a Masters programme this September (i.e. for Academic Year 2015/16). But fear not. The University of Sussex has come to the rescue! Last week the University unveiled a generous new funding scheme to bridge the gap. In particular, a huge boost to the University’s flagship Chancellor’s Masters Scholarships means that 100 students graduating this summer with a first-class degree from any UK university will be eligible to receive a £10,000 package (non-repayable) to study for a Masters degree at Sussex. There are also specific schemes to support students who are already at Sussex; see here. 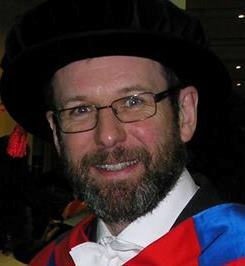 I’m drawing this to the attention of readers of this blog primarily to point out that the Department of Physics & Astronomy at the University of Sussex is one of relatively few UK universities to have a significant and well-established programme of Masters (MSc) courses, including courses in Physics, Particle Physics, Cosmology, and Astronomy. In particular we are the only Department in the United Kingdom to have an MSc in Quantum Technology, an area which has just benefitted from a substantial cash investment from the UK government. This is a huge opportunity for high-flying physics graduates to get a funded place on any of our MSc programmes to start later this year. Indeed, the deal that is being offered is so good that I would recommend students who are currently in the third year of 4-year MPhys or MSci integrated Masters programmes, perhaps at a dreary University in the Midlands, to consider switching to a BSc bailing out of your current course, and graduating in June in order to take up this opportunity. The last year of an integrated Masters consists of 120 credits of material for which you will have to be a further £9K of fees; a standalone Masters at Sussex would involve 180 credits and be essentially free if you get a scholarship. Think about it, especially if you are interested in specializing in Quantum Technology. Sussex is the only university in the UK where you can take an MSc in this subject! Note for Sussex students: if you’re on the 3rd year of an MPhys here at Sussex the situation is a bit more complicated and the incentive to move to MSc is much weaker because we have additional Scholarships to offset the £9K fee for the 4th year. Please feel free to discuss this with me if you want some more information. 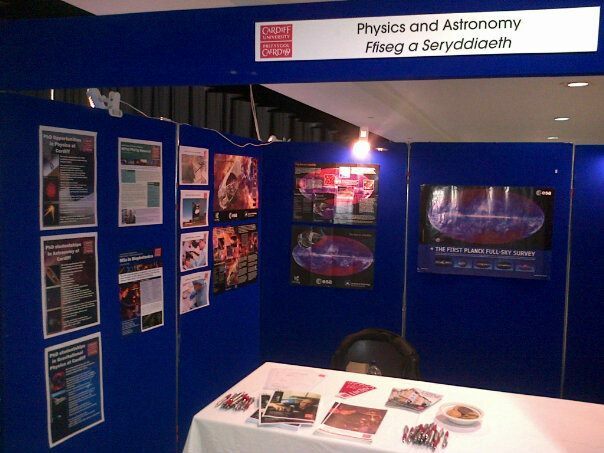 Today was the Postgraduate Open Day for Cardiff University, so I trooped off at lunchtime to man person the School of Physics & Astronomy stand in the Great Hall of the Students in the Students’ Union for the Subject Fair. It’s the first time I’ve ever been in the Great Hall, in fact, for no other reason than it’s for the students not the staff. Anyway, I have to say it didn’t look all that great, although at least it was warm. There’s no heating in my office right now, you see. And they provided coffee and biscuits. It has to be said that a general Postgraduate Open Day like this isn’t a very effective method of recruiting postgraduate students, not in Physics and Astronomy at least. Most potential applicants come to apply by looking at web pages and/or listening to advice from people in the department where they are doing or did their first degree. People have already decided between Physics and, say, Astronomy and certainly between either of those and Sociology, so the idea of stalls competing for custom is a bit absurd. The moral of this tale – if there is one – is that recruitment in different subjects is very different, so the “one size fits all” centralised approach isn’t always the right way to proceed. Schools and departments know their market better than anyone, so they need to be allowed to do their own thing at least part of the time. I suspect this is an argument I’ll shortly be making elsewhere. Exhausted near the end of an exceptionally busy week, I found myself taking a short break after a two-hour lecturing session when a student knocked at my door to ask for some advice about applying for PhDs. I was happy to oblige, of course, but after he’d gone it struck me how much tougher things are for today’s generation, compared with how easy it was for me. I got a scholarship to the local grammar school (The Royal Grammar School in Newcastle upon Tyne) by passing the 11+ examination back in 1974. I got a good education that most pupils at the School had to pay for (or at least their parents did). I got good 0 and A levels, and then passed the post A-level examination to get me into Cambridge. Through contacts at school I got a job for nine months working for a British Gas research station in Cramlington, during which time I earned a nice wage. I went to Cambridge with a healthy bank balance on top of which I received a full maintenance grant. There were no tuition fees then either. When I graduated I was solvent and debt-free. When I applied for PhDs I did so with no real idea about what research I might do. I wasn’t an outstanding undergraduate student and my personal statement was vagueness personified, but I got a place nonetheless. The stipend was modest, but one could live on it. I never had money worries as a PhD. Nor have I since. It all seems so simple, looking back. The pressure we put on graduates now is out of all proportion to what I experienced. The reason? There are more of them overall, so there are more with first-class degrees chasing PhD funding. Many students who are much better than I was at the same stage of my career won’t make it just because of the arithmetic. Many will be discouraged by the finances too. It’s tragic that talented young people should be denied the chance to fulfil their ambitions by not having wealthy parents. I’m often impressed (and even inspired) by those students who show a determination to pursue academic ambitions despite all the difficulties, but at the same time I feel guilty that it was so much easier in my day. Mine is the generation that decided to transfer the cost of higher education onto students and their families. Mine is also the generation that wrecked the economy by living beyond our means for too long. To all those young people whose ambitions are thwarted by circumstances beyond their control all I can say is I’m sorry we oldies stole your future.